For many months, my team have been working on new features to meet user needs that GOV.UK doesn’t currently support and which agencies need before they can transition to GOV.UK. One of these features is a filtered search (popularly known as ‘finders’), and the first one recently went live. On Tuesday 1 April the Competition and Markets Authority (CMA) was formed from a merger of the Competition Commission and the Office of Fair Trading. The CMA seeks to promote competition for the benefit of consumers, businesses and the economy. The CMA publishes many documents throughout the lifetime of its investigations, including calls for information, research documents and competition decisions. A number of specialists rely heavily on this information, including lawyers, journalists and people in the markets or companies under investigation. Before the CMA launched, we spent some time doing research among these groups to understand their information needs. For example, one competition lawyer told us that when a client comes in intending to undertake a merger he needs to look up merger cases in the same sector to understand what’s possible. Journalists often want to look at all open cases that have had recent developments. Examples like these show that users have a need to filter cases by a number of properties, so we decided to build a solution a bit like our business support finder, to allow people to filter cases by multiple properties. We also had to build a new format that supported the complex nature of CMA cases. We based our ideas for this on our consultation format, where the latest development is shown at the top of the page. We tested paper designs with users, and then - after some refinements - clickable prototypes, to be sure we were on the right track. This gave us a lot of feedback to improve the product, and validated the approach in general. One thing we learned was that users wanted to be able to select more than one option for each filter, eg cases in the aerospace sector and in the transport sector, so we made multiselect filters. 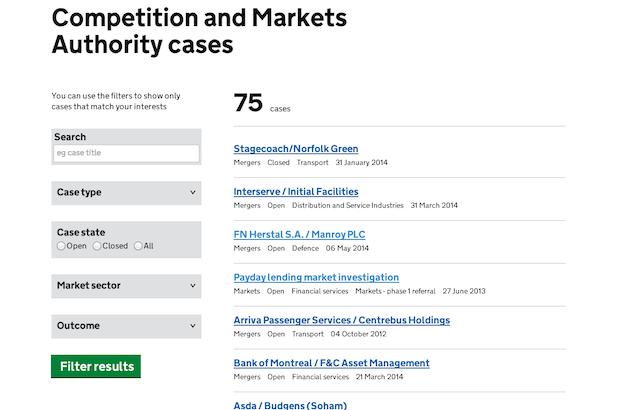 These case pages, and the filtered search to help professionals and the public find them, are now live. We’ll be monitoring how well they perform. Many other agencies or departments have similar needs for custom filtering on specialist content, so we have further finders planned over the coming months. To clarify, is this a further filtering of a sub-set of publications, or is it a filtering system for a seperate database that is attached to GOV.UK entirely seperate to publications? In this case, it is filtering on a different kind of document than any of our existing publication types, because CMA cases had unique requirements. But if there was a need for it, the finder could also be used to filter current publication types.